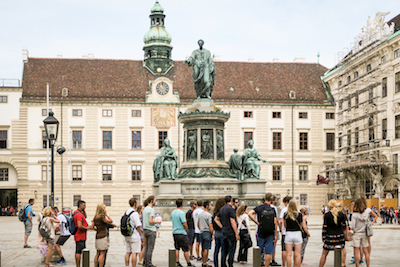 ABOARD THE VIKING VILHJALM — The Hapsburgs ruled the Austro Hungarian Empire from Vienna using their fortune to build Baroque palaces, churches and museums across the city. Those buildings form the core of what is now a UNESCO World Heritage site. 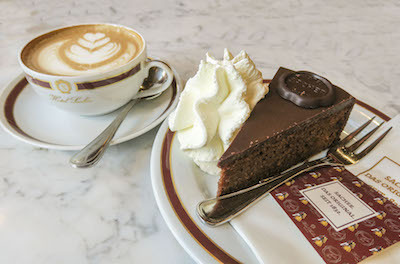 Vienna’s rich history and culture continue to dance —like its famous waltzes — sweeping you in and maintaining your interest. My Viking Danube cruise provided a day with many opportunities to touch and taste the capital of Austria. After my treat, we walked toward the enclave of Hapsburg buildings, taking in the architectural highlights. A stop in the Augustinian Church (or St. Augustin) brought us to the site where many royals married and were also partially buried. Marlise, our guide, explained, “The bodies of the Austrian Habsburg emperors are each buried between three Vienna locations; their entrails in the crypt of St. Stephen’s Cathedral, their bodies in the crypt of the Capuchin Church, and their hearts in silver urns in the Loreto Chapel of the Augustinian Church.” The joke is the Hapsburg’s don’t rest in peace – – they rest in pieces. A slow stroll past behemoth statues and monuments, brought a wealth of information about the monarchy, politics, wars and specifically Franz Joseph and Sisi, his wife who is often compared to the late Princess Diana of England. Eventually we made our way to St Stephen’s Cathedral, topped with it’s a massive reconstructed Gothic spire rising above all. World War II ravaged the structure, now fully repaired. We were set free to explore inside the church at our own pace before meeting up for the subway ride back. The afternoon brought a behind-the-scenes tour of the Lipizzaner Stables. 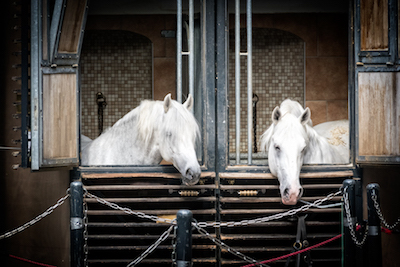 The Lipizzaners, a renowned breed of white horses, get their training at the Spanish Riding School of Vienna. Nothing new, the Spanish Riding School celebrated its 450th anniversary in 2015. To perfect the difficult equestrian maneuvers, the matched rider and horse train anywhere from 8-12 years before performing in public. No photos were allowed in the stables, but afterward, I captured one with a long lens from an exterior window. The large horses show amazing muscular development. Dark in color at birth, the foals only gradually turn white as they age. Our excellent guide explained that there are three branches of the Spanish Riding Academy. Piber serves as the breeding and birthing ground. Young stallions go to the second, the Heldenburg training center to begin their training. This center also serves as the vacation spot where performance stallions spend six to eight weeks in summer. Retirees spend the rest of their lives at Heldenburg. The third branch is the “haute ecole” or high school where rider and horse train in Vienna. It includes the fabled performance hall decked out with crystal chandeliers. The tour included the tack room, full of various items of gear, including the performance sets. The guide explained how they were mad, and adjusted. A visit to the training ring offered got a peek inside the performance hall from a horse’s point of view. If only we could have seen one do a few maneuvers, but you have to go to a show to see that. Apply for tickets well in advance. Back onboard, my full day continued with an early dinner arranged for those of up who signed up to go a concert. Usually, Viking River cruises offer just one dinner seating. We followed dinner with a return to the city, to hear the Wiener Hofburg Orchestra. 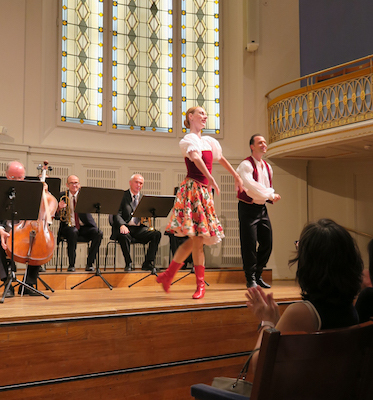 The Mozart-Strauss performance proved better than expected, including two opera singers and two dancers. We heard Strauss waltzes and selections from Mozart’s The Magic Flute—music that has defined this magical city. I’d call the repertoire more lighthearted, but entertaining.